Not to state the obvious, but it’s been hot out of late; the kind of weather that has us craving nothing but fresh, light, easy-to-make meals. 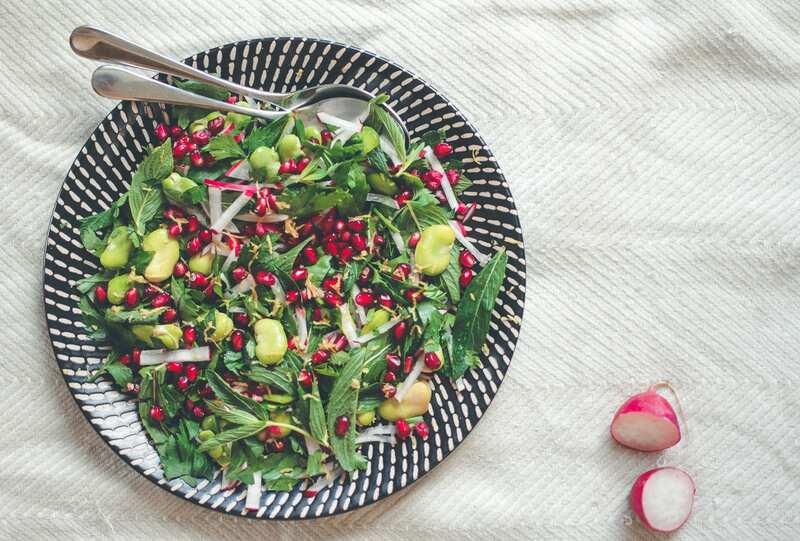 This pomegranate, mint and broad bean summer salad is the perfect summer dish, full of seasonal produce to keep you satisfied in the heat. If buying the broad beans whole, they will need to be double podded – this can take time and patience but think of it as a little after work meditation (trust me, it truly clears the mind). If you can’t find broad beans or you’re time poor, simply swap them out for pre-podded edamame beans – it’s up to you. Remove the outer casing of the broad beans so you are left with a good helping of individual pods. In a saucepan of salted boiling water add podded broad beans and cook for approximately 4-5mins (if using edamame cook as per packet instructions). Drain broad beans and rinse with cold water – allow to cool. Roughly pick mint and parsley leaves and put into a large bowl. Chop up remaining parsley stalks and add to the bowl. Cut the radishes into thin matchsticks or use a mandolin to thinly slice them into your desired shape. Remove the outer layer of the broad beans one by one (it is easiest to first tear the skin and slide it off). Add radish and podded broad beans to the mint and parsley. Grate the lemon zest. Add juiced lemon, olive oil and most of the pomegranate seeds (leave a handful to dress at the end) to the bowl with mint and parsley. Toss everything to combine. Arrange onto a serving plate and top with remaining pomegranate seeds. Serve with your favourite protein as desired.